In what may well stand as a defining moment in the maturation of Apple’s App Store, Tapulous has announced that it has partnered with the band Nine Inch Nails to release a premium version of its popular game Tap Tap Revenge some time in October. The application will include a NIN-centric theme, as well as over a dozen of the band’s songs from its last two albums. The partnership is among the first to bring licensed content to an iPhone application, and will likely prompt a wave of similar deals between other musicians and applications on the platform. Tap Tap Revenge is the iPhone’s version of Guitar Hero – an intuitive, addictive game that has emerged as one of the platform’s most popular since its launch in July, with nearly 2 million total users. It’s also perfect for selling bite sized packages of premium content – users would gladly pay a few dollars to be able to play some of their favorite songs (the makers of Guitar Hero and Rock Band have made fortunes following a similar model). Tapulous says that it will be announcing more premium bundles of music for Tap Tap Revenge in the coming months. Provided the app does well (and I think it will), expect to see more brands and artists step forward to release their own applications (or acquire the popular ones that are already out there). 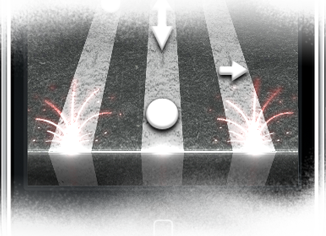 The most lucrative apps will be the ones that can fuse licensed media, as Tap Tap Revenge has. But we’ll also be seeing more branded apps – it won’t be long before we’ll see iBeer by Coors, or Fender’s PocketGuitar (there’s already a lighter app by Zippo). The App Store is still in its infancy, and we’re only beginning to see its potential for monetization. As part of today’s announcement, Tapulous has also released a list of its new hires (earlier this summer most of the company’s original team left because of disputes over the direction of the company). Among the hires are designer Bryan Bell, Zach Allia (founder of Facebook’s Free Gifts), and engineers Jessica Kahn and Kyle Kinkade.